Start your day with breakfast at Des Ambassades. Roger and I can be found here most Sunday mornings, waiting for our laundry to dry. Everything on the menu is delicious, but for breakfast, I’d especially recommend the almond croissant, which I like to say is made with unicorn blood (it’s actually almond paste), and which is the best croissant I’ve ever eaten (even better than croissants I’ve had in France), with a coffee of your choosing. They also have really delicious Senegalese dishes for dinner, and some truly amazing crème brûlée for dessert. Once you’ve enjoyed your croissant, you’ll find you’re right in the middle of things, and that you can walk in nearly any direction and find something interesting to do. If you walk west, you’ll find Morningside Park, which is small, but has a few playgrounds, a duck pond, basketball courts, and some baseball fields. If you walk up the steep stairs, you’ll find yourself in Columbia territory. The campus is lovely, and worth a visit. The Butler Library there often has exhibits up, and they’re usually interesting and free. On Sundays, they have a small farmer’s market with some great booths. You can also stop by the Cathedral of St. John the Divine, one of the largest churches in the world, and also a work in progress since 1888. There are also peacocks in the backyard! If you’re in this area and ready for lunch, I’d recommend stopping at Toast or Mel’s Burger for lunch. Both have great burgers and strong beer selections at reasonable prices. Other great lunch places include: Blockhead’s, Dosa Cart, and Roti Roll. If you’d rather head south, you’ll find yourself passing Le Petit Senegal on 116th St. If you’re interested in trying Senegalese food, there are a few good restaurants here to try, along with the Malcolm Shabazz outdoor market, where you can buy West African cloth and goods. If you continue south, you’ll run into Frederick Douglass Circle, which has a nice plaza surrounding a statue of Frederick Douglass, featuring traditional African American quilt designs in its paving pattern. complex colored paving pattern that alludes to traditional African American quilt designs. You can hop over to Larry’s Freewheeling and rent a bicycle here if you’d like to explore more of Central Park. If you’d rather continue on foot, though, you can explore the northern tip of the park and Harlem Meer, a really lovely pond and the Charles A. Dana Discovery Center, where you can borrow a fishing pole in the summer. The Lasker Pool and Ice Rink is also relatively close, if you’d like to take a swim or go ice skating. If all that activity gets you hungry, I’d recommend stopping at Maoz, a falafel chain that I think is really fantastic, on the bank of the pond. You can also head back north a bit to Amy Ruth’s, which has some of the best southern food in Harlem (if you go, get their Kool-Aid of the day! ), or Zoma, an Ethiopian restaurant with great platters to split. After lunch, you should head north, where you’ll pass “Swing Low,” one of my favorite sculptures in all of New York. 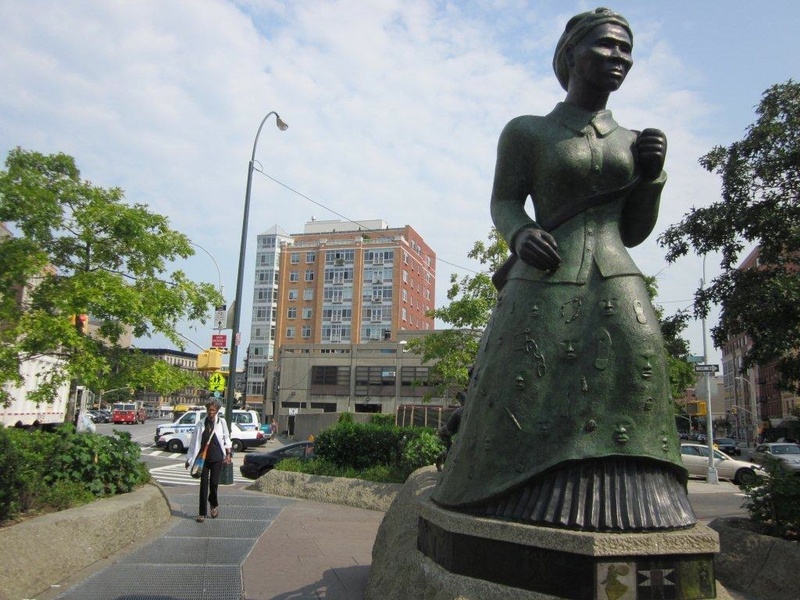 A statue of Harriet Tubman by Alison Saar (who you might remember from our trip to New Orleans), it’s facing south instead of north because Saar wanted it to stand as a reminder not of Tubman’s first journey north, but all the journeys she made south, where she risked her freedom to help others. Keep heading north, and you’ll find yourself on 125th St, the most famous street in Harlem. Here, you’ll find plenty of people selling various things on the street, along with a number of higher-end chain stores. Drop by the Studio Museum, which has been featuring artists of African descent since 1968 and is open for free on the first Friday of every month. At dinner-time, you’ll have several options for your meal. The most obvious is Red Rooster, where Marcus Samuelsson serves up traditional southern food with a Swedish and Ethiopian flair. It’s gotten a lot of publicity, and I’ll be honest: it isn’t my absolute favorite restaurant in New York, but it’s strong and if you’re interested, definitely worth checking out. Sylvia’s is next door, and though I’ve wanted to go for several years, I’ve still never tried it. Likewise, Maison Harlem is supposed to be great, but I haven’t had a chance to go yet. Corner Social, just across the street, has a good selection of American-fare, and Bad Horse Pizza, just a bit south, has fantastic brick-oven pizza in a calm, casual setting. In the evening, you can also take in a show at the National Black Theatre or the Apollo Theater, a Harlem tradition. If you’re in the mood for bowling, Harlem Lanes is right around the corner, as is the Magic Johnson Movie Theater, which I can tell you from personal experience is always an interesting spot to take in a movie. In the evenings in the summer, there’s usually a concert at Marcus Garvey Park, and it’s almost always worth taking in. There are a number of good bars in the area, including Shrine, 1020, Harlem Tavern, and Bier International. And, when you’re ready to tuck-in for the evening, I’d recommend A-Loft, which is a really nice hotel at an affordable price, and centrally located near several subways and the M60 bus from LaGuardia. I hope you'll come visit soon, and when you do, give me a call!